This is an Ableton Live Sampler rack loaded with multiple samples from when I used to own a Dave Smith Instruments Mopho, I sampled the hell out of it with Ableton Live but unfortunately I lost the hard drive with most of the Ableton Live Sampler samples. This Freebie is one of the few Ableton Live samplers I have left from that amazing synthesizer. 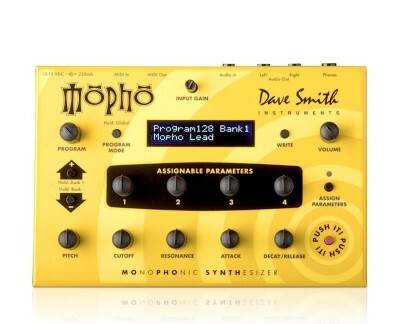 The Dave Smith Mopho samples are loaded into an Ableton Live Sampler instrument.. Enjoy! This Ableton Live Sampler contains samples from the DSI Mopho which is a pretty amazing desktop synth for studio production. I sold the mopho because the original mopho had encoders instead of pots. The encoders did not work well for live performance and that was the primary reason I purchased the synthesizer. So my plan was to sample the synth and create a bunch of Ableton Live Sampler racks. My plan worked pretty darn well until loosing all my Ableton Live Sampler samples. That being said after I sold the mopho a soon regretted it. Even though the synth would not work out for me in a live performance situation, in the studio I missed the phat sub and flexibility of sound. The built sequencer was pretty awesome and it synced up pretty well with Ableton Live. Before selling the synth a spent some time sampling all my presets and the raw sounds but as mentioned earlier, I lost most of the samples. So I highly recommend getting squared away with an online back up solution. Personally I use Copy.com . Which offers 20 gigs free and will auto sync with multiple computers. you can also get 1TB for $10 a month, which is what I use. All of my files are auto backed up plus I can easily share the files with other people. Another reason I use copy is because you can create aliases of your files and place the aliases into your copy folder. Copy will then follow the path and back up the files. This set up is great for multiple drives and enables you to not have to tell Ableton Live where all your samples went. Moral of the story don’t sell your synths and back up all your files. Enjoy the Mopho Ableton Live Sampler Instruments.